New research shows it would have negligible effects on low income moderate drinkers’ alcohol consumption and spending. IRELAND IS SET to introduce minimum pricing for alcohol in the near future. But how will it affect the average resident? The first study to consider just that has thrown up some interesting results in the UK. Researchers looked at how drinkers from different income groups would be affected by minimum pricing in terms of consumption, spending, deaths, illnesses and costs to the health service. According to the modelling study from the University of Sheffield, published in The Lancet today, minimum pricing for alcohol of 45p per unit would reduce deaths and hospital admissions among high-risk drinkers who purchase large quantities of low-cost alcohol. However, it would have negligible effects on the consumption and spending of low-income, moderate drinkers, researchers said. The model analyses how consumers respond to price changes and estimates how those in different income brackets and socioeconomic groups would change their drinking habits and spending if a minimum price for alcohol of 45p per unit were implemented. The results show that minimum pricing would have the most pronounced effects on the 5 per cent of the UK’s population whose drinking is classified as harmful (more than 50 units per week for men, and more than 35 units per week for women). Three quarters of the total reduction in alcohol consumption resulting from minimum pricing would occur in harmful drinkers, with a predicted annual reduction in alcohol-related deaths of 860 and hospital admissions by 29,900 per year. High-risk drinkers on the lowest incomes spend, on average, just under £2,700 every year on alcohol. Of that about two fifths is purchased for less than 45p per unit. They would, unsurprisingly then, be most impacted by minimum pricing. In contrast, the effects on moderate drinkers would be very small. Moderate drinkers in the lowest income group buy, on average, less than one unit of alcohol per week below the 45p threshold. They would reduce their consumption by about two pints of beer per year (an estimated 3·8 units), with an increase in spending of just 4p per year. Across the entire population, moderate drinkers are estimated to reduce their consumption by just 1·6 units (approximately 1 pint of beer) and spend just 78p more per year. “Overall, the impact of a minimum unit price policy on moderate drinkers would be very small, irrespective of income,” is how Dr John Holmes summed up the study. The policy would mainly affect harmful drinkers, and it is the low income harmful drinkers—who purchase more alcohol below the minimum unit price threshold than any other group—who would be most affected. “Our study finds no evidence to support the concerns highlighted by government and the alcohol industry that minimum unit pricing would penalise responsible drinkers on low incomes. 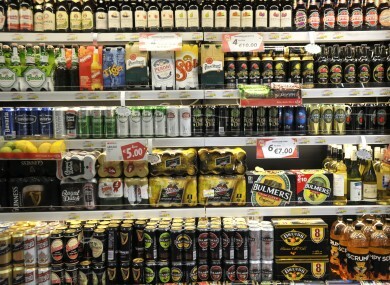 There have been calls for minimum pricing to be introduced in Ireland with the Cabinet agreeing to proposals last year. Last October, the Department of Health stressed that the move will not mean across-the-board price increases. The aim of MUP is to increase the price of alcohol which is cheap relative to its strength,” it said. MUP will be the instrument to be used to tackle the very low cost at which alcohol is sold in the off-trade sector (particularly in supermarkets). Scotland has already passed – but not implemented – legislation to introduce a minimum price below which a unit of alcohol cannot be sold to consumers. The UK has recently withdrawn its commitment to introduce a similar policy. It cited concerns about a lack of evidence of effectiveness, as well as the impact on moderate drinkers with low incomes. According to the report, assessments of implemented minimum price changes for alcohol in Canada have suggested that a minimum unit price would reduce prevalence of deaths and hospital admissions related to alcohol. Email “860 fewer people would be killed by alcohol every year if minimum pricing was introduced”. Feedback on “860 fewer people would be killed by alcohol every year if minimum pricing was introduced”.